We’re back in the heat of Spain after a nice, cool break in the Alps. Yesterday was a particularly hot, windless day, with the temp in the cabin at a rather oppressive 94F. Baxter was pretty unhappy about it, panting and lethargic. Then, I hit upon a brilliant idea! 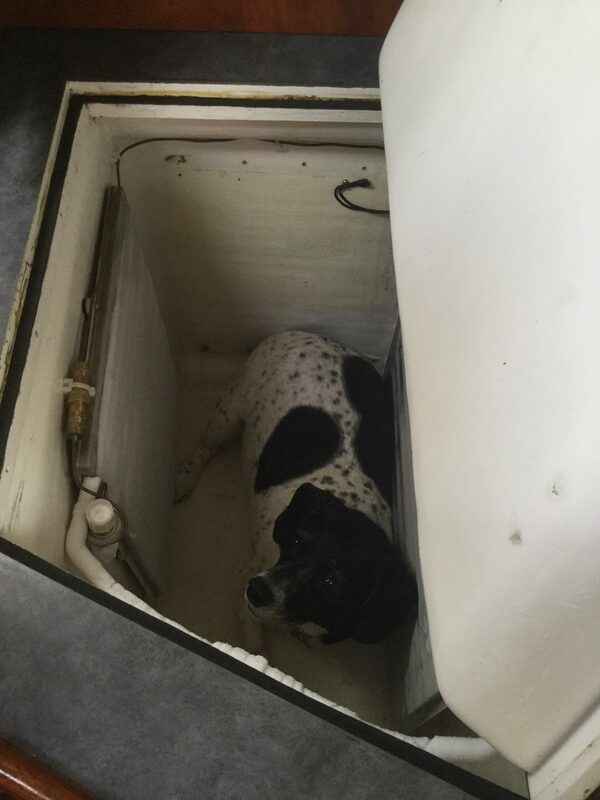 The freezer didn’t have anything in it yet, and it happens to be just the right size for B to fit in. He likes small spaces, and he likes cool, so why not give it a go? So, we gently lowered him down into our top-loader, and he immediately pressed up against one of the cold plates and gave us this contented look. 10 minutes later, properly cooled, he asked to come back out. He wanders over there every couple of hours now during the hottest part of the day and requests a session is his personal cooling chamber. Jenny would like to note to all who might find this to be a little gross that we’ll be thoroughly cleaning the freezer out before we put any food in there. This entry was posted in Uncategorized on August 22, 2018 by JennyDurnan. Abolutely love this, poor baby boy dog, he has to wear a fur coat! Miss you guys so much!!! Awe Linda we miss you too! Hopefully we’ll be able to visit again next year! hello to you all from Panama, he’s such a lucky chap having you two to care for him. He looks sooooo cool too. Our 3 dogs here are just envious, I showed them the photo, one even tried to lick the screen I think he must have been, thinking lolly pop, but he does eat anything. We get them frozen treets out of the freezer on a very hot day. Tina and Steven from Puffin in La Linea, thinking of you and happy you are all ok.